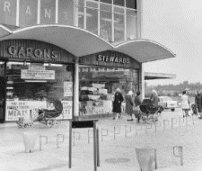 Since 1958 when the first shops began opening, Basildon town centre has been the home for a whole host of differing consumer businesses. As the main regional shopping centre serving the new town, it is right at the heart situated in an ideal position between the two existing towns of Pitsea and Laindon. It's inevitable that over time some of these businesses are no longer to be found trading in the town centre. Some move on, (even relocating within the Town Centre itself), while others simply close down unable to keep up with the competition. This is the way of all town centres, although Essex is a very competitive region to trade in, and in modern times, with greater use of the car, the consumer is often spoilt for choice. Shopping trends have changed since those early days and both town centre and High Street in general now face increasing competition in the form of 'out of town' shopping following the creation of the retail park. These 'shopping parks' invariably host the major retail names - often housed within superstores with free parking - and have proved very popular and now become an established alternative to the conventional town centre. Thurrock's Lakeside complex, which opened on October 25th 1990, is the most notable locally but others have sprung up, including some within Basildon itself like Mayflower and Pipps Hill. Through all this Basildon town centre continues to keep pace as seen recently with the opening of the Westgate Shopping Park in 1999 and the H.M.V. shop in Eastgate in 2001. The list below represents a small sample of changes and closures in shop businesses as seen in Basildon town centre during the first 50 years of trading to August 2008. It is both interesting and thought provoking, particularly with respect to small businesses competing with the big nationals. On 27th December, 2008 Woolworths ceased trading and the shop was later halved into two units. Woolworths had occupied 23 Town Square since its completion in 1960 thus leaving W H Smith as the sole surviving occupant of the original first phase Town Square. (1) The lists includes entries for shops that have closed or relocated since August 2008 that had traded at some point during the first 50 years. Some dates are approximate and will not be consecutive given that a vacated unit may have remained empty, in some cases, for a number of years. (2) The first shop to open was Laindon trader Henbest & Son at 65-67 Market Square on 16th August, 1958. Text researched and written by William Cox, 2001 with revisions 2002-2003, 2008,2012. Copyright © 2001-2003,2008,2012, B. Cox - Basildon History Online. All rights reserved.